I started off Friday trying to fix two running lights I noticed were not working when I turned on the new marker lights Thursday evening. Over time bulbs wear out, connections become a little corroded, wires fray, and suddenly you have a couple of lights not working as they should. I started troubleshooting the problem with no expectation of how long it might take, but was pretty certain they would be working at the end of it all. Ultimately the problem with each non-functioning running light was a worn out bulb, but getting the expired ones out was difficult, and then the same with the new ones. There was very little clearance for my bulky fingers to grab and twist the bulbs out.....I finally had to cut a piece of duct tape and roll it with the sticky side out to grip the bulbs with enough traction to take out the old ones and install the new ones. Additionally, the lens on one was cracked so, not having a replacement lens available, I used super glue to seal the crack. So now, for the first time in a long time all the marker and running lights work. It hasn't been a big issue as we rarely drive at night, but I do like things to work. I finished with the light project about 10:30 and decided to take another run on my road bike up to the Emerald Bay overlook again. Friday was the first time I have done this ride with only my riding shorts and a short sleeve shirt.....it was so cold the first few times I rode that route I had to really bundle up. As I approached the overlook I realized I was breaking my old time of just over 47 minutes by a lot! Just as I pulled into the parking lot the timer on my Garmin 205 Edge read 43 minutes, 12 seconds......I was not expecting a 4 minute improvement! All the mountain biking I have been doing with the 3-4 mile steep climbs is paying off! This time, instead of stopping to take in the view, take a few pix, and catch my breath, I just turned around and headed back down the hill seeing how long I could stand in the pedals......this is the part of riding up a long hill that comes in handy for when I ride my mountain bike. When you are making a long downhill run mountain biking you, at least I do, spend a lot of time just standing on the pedals. If you are not used to this your legs eventually start feeling like jelly. The first few times coming down the hill I could only stand on the pedals for a 1/4 mile here and there, but this time I was able to do it for a mile at a time. The total round trip ride took 74 minutes, also another personal best. We had a date to ride over to Steamer's Bar & Grill with Bill and Debby at 1 pm for their weekly fish taco Friday, but Debby had not yet returned from a hike, so the 3 of us pedaled over. 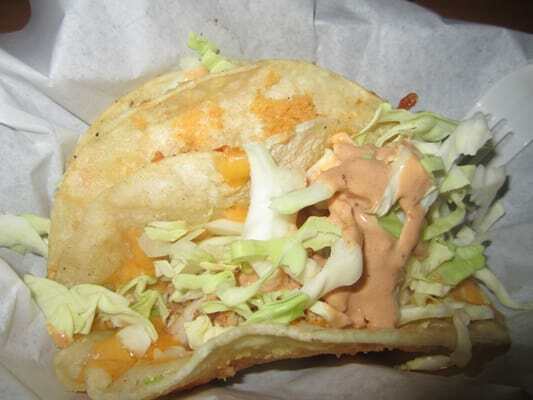 I cannot relate adequately how good their fish tacos are.......until arriving here in SLT my favorite fish taco place was Rubio's, which I wrote about when we were in Riverside for a few months.....now I'm not sure who is first, and who is second. I had my usual 2 fish tacos, and TLE had one this time....we chased them with ice tea. We enjoyed a pleasant time talking with Bill about the local area hiking trails, and his 99.99% Vegan diet (he and Debby are Vegans). As most of you probably know a Vegan diet is strictly plant based......no meat, no dairy.....just plant based food. On the other hand vegetarians do eat dairy products. I admire those who can forego dairy and meat in their diet, but it is not for me. Obviously Bill and Debby make rare exceptions for meat, and fish tacos at Steamer's is one of those extremely rare exceptions. I think Bill has lost at least 30 pounds over the last two years with this new dietary lifestyle. We returned back to TVC around 2:15, and I spent the rest of the afternoon vacuuming out the trailer, cleaning off the back of the coach, and installing a "screen door" on our coach entry.....we had been using one we fabricated ourselves out of a product called "Magic Mesh" we bought off a TV ad, but it never worked as well as we had hoped. Don't get me wrong, it is a good product, but we had to modify it for our application, and we just couldn't get it to work with our modifications. When we were visiting our friends, Tom and Darlene, in Wittmann, AZ they gifted us their old screen door from their 1990 Newell (they have a 2002 now, and it has a built in screen door). TLE spent part of Thursday working on our old "screen door" before deciding the best option was the custom made one we got from Tom and Darlene, so I installed the snaps for it and hung it. Once TLE has it all adjusted just the way she wants it I'll take a picture and post it.....it will be nice to be able to leave the door open once the weather gets a little warmer. Friday was the end of the first of 7 fortnights for us here in SLT, and it is not even June yet! Still waiting to hear when we will start working, but in the mean time we are just enjoying our free time, and exploring the surrounding area. Scratch one more off the "to list".....almost since the day I bought the Newell I have been looking for replacement red marker lights such as the ones seen in the picture below. I have been able to find the amber colored ones found on the front cap of the coach. Why the red lenses are no longer available I have no idea. A few months ago I used the last replacement lens that came with the coach, and the remaining 4 lens had cracks, and were showing their age of 32 years. I was in the process of planning to change the front and rear marker lights to ones that are still in production, but really didn't want to as I prefer to keep the exterior look of the Newell looking the same as the day it came out the factory door for delivery. 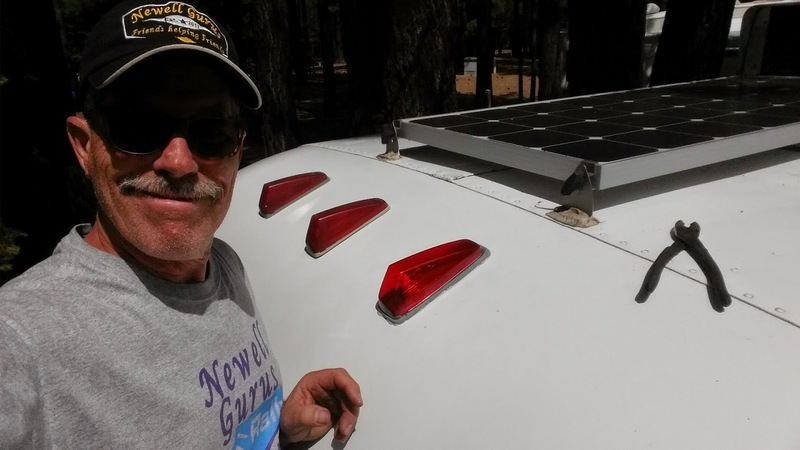 Enter my good friend Todd, who owns a 1984 Newell with the same exact marker lights I have. He found some NOS (New Old Stock) red marker lights just like ours on eBay a couple of months ago and sent me the link. I quickly bought 5 and had them shipped to Todd's home in Sioux Falls for me to pick up when we arrived there to pick up the NOS bumper he also found for me on eBay. I had planned to install the replacement marker lights when I was in Sioux Falls, but you will recall that there was this stiff east wind blowing at 25-35 mph for most of the time we were there, or else it was raining cats and dogs......not the kind of weather in which you would wish to spend 2 hours at the top of a tall ladder. Well, finally Thursday it was time to do the deed, and the new lights were installed. I was able to salvage one pretty new lens, and three light bodies for use in the future should any get broken. I am eager to report that I estimated the job would take 2 hours, and it took slightly less than two hours.....no unforeseen complications. We should be good now for another 30 years! The weather here in SLT continues to be pleasant with daytime temps running from the high 60's into the high 70's.....in fact the forecast, or guess, for the next 10 days is nothing but low to high 70's with mostly clear skies. So, it should be no surprise that we decided to call Thursday afternoon a beach day. Our friends, Bill and Debby, had suggested we check out the beach at Tahoe Keys....I have driven by the Tahoe Keys Blvd. 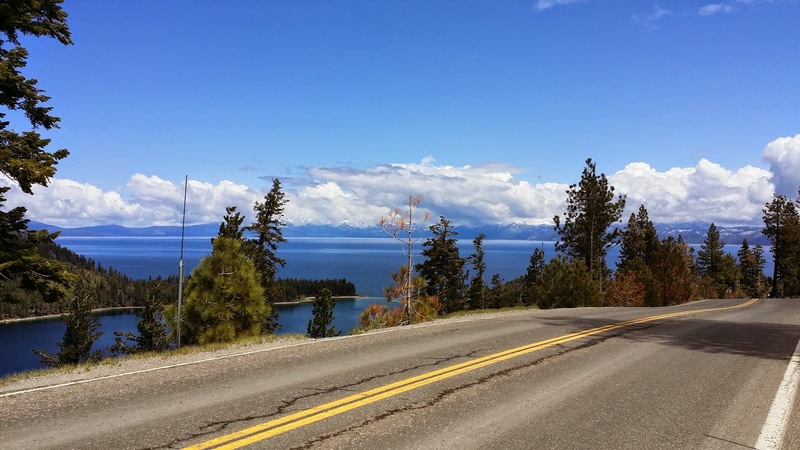 sign for decades and never driven down it, so Thursday we hopped on our Cannondales and rode the 3.5 miles over to the Tahoe Keys Beach, and we are so glad we did! Once you reach the Marina area located on Venice you must take a compacted dirt path about a third of a mile the rest of the way to the beach, which thins out the number of people who will make that effort. The result? A beach that has a sort of "private" feel to it. When we arrived there was just one other person on this balmy afternoon. We sat on the beach under the shelter of a beach umbrella we have been carrying around with us for 27 months, but have only used maybe once before, reading and just enjoying the view.....I never get tired of this view. It is hard to believe we have been here in SLT just shy of 2 weeks, and have 3 months to go in our sojourn. We spent the evening watching a very exciting NHL game 6 between the N.Y. Rangers and Montreal Canadiens, which was won 1-0 by the Rangers, and then an NBA game 5 between the Spurs and Thunder, won in convincing style by the Spurs with a 28 point margin. Wednesday morning we cooked breakfast outside again on the Coleman stove....this time it was french toast and scrambled eggs.....why is it that food cooked outdoors always seems to taste better? I haven't scratched any items off my "To Do" list for a few weeks now so Wednesday seemed like a good day to cross another one off the list. Whenever I decide to enter the "handyman zone" I often wonder if I have allotted enough time for the task. As I have alluded to on numerous occasions, it seems that no matter how straight forward a task may seem on the surface there is always some unexpected complication that multiplies the time needed to complete the task by a factor of 3, or 4. A great example of what I call the "Hockwald Way" was the removal of the 32 year old bathroom 3 piece faucet and the installation of the new one a few weeks ago in Sioux Falls, SD. I figured 2-3 hours maximum.....it took over 12 hours. So when I decided it was time after 3+ years to finally install the permanent XM radio antenna on the trailer roof I was a little "iffy" on whether the hour I had allotted would be anywhere near sufficient to complete what seemed to be a simple task. Until Wednesday I had been using a temporary antenna which I would run via cable to the outside of the trailer and up on the roof. This was pretty easy, and did not involve drilling any holes in the roof, which I abhor, but this necessitated me remembering to remove the antenna from the roof each time we hit the road again. Needless to say, there was more than one occasion when I forgot to put it away, and would eventually see the antenna flapping in the breeze as we motivated down the road requiring that I pull over on the shoulder of whatever byway we happened to be traversing at the time and put it away. As it turned out one hour was more than sufficient for the task, which resulted in my questioning why I had waited soooo long....that was an easy question to answer....I waited so long for good reason....there is no accounting for the "Hockwald Way" and when it will strike. Of course, with every DIY* success I have I become more emboldened to tackle more projects I have been deferring out of concern that days might be lost out of my life if the "Hockwald Way" were to strike unexpectedly. Around 11:45 TLE*** and I took off on a slow walk to do some minor shopping for a couple of projects, and have lunch.....one project was TLE's....finish the screen door modifications for our entry door, which required 15 feet of industrial strength Velcro.....I'm not sure that should be capitalized, but when you pay $27 for 15 feet of Velcro you feel the need to capitalize something. The other long deferred small project for me was to get a digital timer to automatically turn my outdoor decorative LED lights on and off. We first walked to the local Kmart hoping to find TLE's Velcro, but they did not have what she needed, so then we hung a walking left at the "Y" on Lake Tahoe Blvd. to hit up the local TruValue Hardware store, which also did not have what she needed....they also had no timers. Then it was another 2 blocks down to the DIY Center (Do It Yourself Center) where we found everything we needed, including my digital timer. TLE*** wanted to try out a little Mexican place called Taqueria Jalisco, which gets 4 solid stars from Yelp. It was 1.9 miles from the "Y" to Jalisco's, but who is in a hurry, right? It was a great day for a walk, and one of the great things about walking along at 2-3 mph is you see stuff you would never see driving in a car, and even riding a bike. As we walked eastward we discovered a couple of thrift/antique shops we had not seen before and resolved to check them out on our walk back. We loved Taqueria Jalisco! When you enter you are given two bowls of taco chips, and directed to their salsa bar to choose your "poison". Within minutes of being seated our waiter was taking our orders, and advising us to choose our drinks from the glass faced refrigerators, and they would add them to our bill. This can be a little off putting to some, but when you see the bill you will appreciate how they do things. For 4 street tacos (2 for each of us), a Negra Modelo beer for moi, a bottle of tea for TLE, plus unlimited chips and salsa our charge was $10.50! The other day at Burger Lounge we ordered a plate of fried zuccini, and two soft drinks....$21! Need I say more? We will definitely be back Taqueria Jalisco! As planned we stopped off to investigate "The Attic Thrift Shop", "Mountain Treasures" and the "Rural Squirrel" on our way back "home".....amazingly we managed to leave each store with no new books, or anything else for that matter....maybe it was because we still had a mile walk home....:) We arrived back at the coach around 3:15 having walked close to 7 miles.....what a nice afternoon! I spent about an hour after we got back "home" trying, and eventually succeeding, to program the new digital timer I bought.......should have taken 5 minutes.......the "Hockwald Way" strikes again! We watched the NHL Kings vs. Blackhawks game, which ended up going to double overtime before the Blackhawks prevailed on a sudden death goal to win 5-4......now back to L.A. where we hope the Kings will close out this series out and return to the Stanley Cup Finals. To finish out the evening we watched the season premier of "So You Think You Can Dance", to be referred to from this point on as "SYTYCD". You know how you have dreamt about some future vacation, and built it up in your mind to the point where the reality of what you had planned had no chance of living up to the image you had in your mind? And you no doubt remember that sometimes all that planning and dreaming was dashed to pieces on occasion by Mr. Jello? That used to happen a lot to me before I became a nomad. When your life is proscribed by the boundless schedules, responsibilities, and duties that are implicitly a part of normal stix and brix living, of raising children, and of a workaday life you feel you must squeeze every ounce of pleasure and adventure out of your recreation time......the time you carved out of your busy schedule to get away from it all and do things for which your regular life had no available time slots.....there was no place for Miss Serendipity.....in fact she probably attempted to introduce herself on more than one occasion, but you just ignored her advances.....she was not part of your master plan for the "perfect vacation". At the end of your "vacation" you felt like you needed another vacation to recover from the vacation......often you returned to your "regular" life exhausted from all the fun you had....and you never thought the vacation was long enough. It doesn't matter whether it was a 3 day weekend, or 2 weeks, or even a month......it was never long enough, because you tried to create the dream vacation every time, which is, of necessity, crammed full of activities, and must do things. You never really got the chance to just let the fun, adventure, or just "life", come to you. That is the charm of the nomadic life.....no planning, no expectations.....just take life as it comes at you. The first few months of traveling we lived like we were on vacation, and this seems to be pretty typical for "new" nomads. You never stay anywhere more than a few days, and you crisscross the country several times. For us it took almost a year for us to realize we needed to slow down, and to realize that we were not on vacation....we were just living on the road. When we arrived at my sister's home in Spokane, WA after 4 months of travel we had already covered 8,000 miles....we were exhausted. We spent 5 weeks in Spokane getting to know the town. It was the first time we had thought about sitting in one place for an extended time frame, and we really liked it. We came to know the area surrounding Spokane all the way to Couer d'Alene, and really liked what we found. Our next experience involving extended stay was in Campbellsville, KY where we resided for almost 11 weeks while we worked at Amazon. We got to know the surrounding areas, and came to appreciate the beauty of Kentucky, plus we met and became good friends with a number of people. But even then we did not quite realize the value of extended stays in one place. Then it was down to Cedar Key, FL where we stayed for 5 weeks really integrating ourselves into the community, and this is where we really learned to slow down and let life come at us......it is where we first became acquainted with Miss Serendipity, and her sidekick Mr. Jello. We met some amazingly interesting people in Cedar Key, and developed friendships that have been renewed over and over again as we travel.......slowly.....from point to point. That first 12 months we covered over 12,000 miles, and crossed the U.S. 3 times.....the last 17 months we have traveled just over 8,000 miles. So, fast forwarding to the present, here we are in South Lake Tahoe for the summer. Since I was a little kid I have wanted to spend the summer at Lake Tahoe. When we first conceived the idea to spend the summer here I had no idea what it would end up looking like, and frankly after just 11 days I still do not know how it will all turn out, but what I do know is that we are just letting life come at us, and not really doing any long term planning. Whenever we get the chance to meet new people we embrace it.....we spend more time walking around exploring. We don't know when we will start our jobs here at TVC.......the day is coming soon, I am sure.....but for the moment we are just enjoying "being" here. This is the evolution most nomads experience. I was just watching a video interview our friends Chris and Cherie, of Technomadia fame, did as part of their on going series called "Ramblings: Tales from Nomads" with Nina and Paul, whom we will meet in person for the first time when we travel to Cape Blanco Lighthouse in September. While their background is different than ours, their evolving living life on the road in an RV parallels ours, and that of many others we have met along the way. Click on this link to see their interview. Tuesday I was invited on another MTB ride by Michelle D......she does a couple of rides each week with a few other ladies (Michelle M. and Jennifer in this case) who are all good riders. I'm not used to being the only guy in a riding group, but in reality it still felt like riding with the "guys". We did a 3.5 mile grinding climb up 8-12% grades to Angora Lake. The ride started at just under 6,700' elevation and topped out at 7,450'. There is a small resort on this tiny lake with several cabins, and a camp store.....apparently there is a 2-3 year waiting list to get into one of these cabins. This is a place I would love to bring TLE for the afternoon. Of course, after paying the price of the climb we had earned the reward of the downhill run back to the cars.....and what a run it was. In all we rode for just under 2 hours and it was not even Noon yet. I returned home thinking I would work on a few projects that have been sitting on my work bench since we arrived here in SLT, but ultimately had to admit that even though my conditioning is pretty good, I need more recovery time than I used to require, so I spent the afternoon napping, and reading. TLE had me grill up some chicken asada purchased a couple of weeks ago at Trader Joe's in Carson City, and then we enjoyed Street Tacos Tuesday sitting outside whilst watching part of the Rangers and Canadiens hockey game, then part of the Spurs and Thunder basketball game while sitting by the fire.....the first fire we have had since we arrived in SLT. Around 8:30 we went inside to watch a DVD movie I had bought a couple of months ago at a Walmart somewhere in Arizona, or Utah called "Source Code" which we actually enjoyed. We liked the premise and the surprise ending. 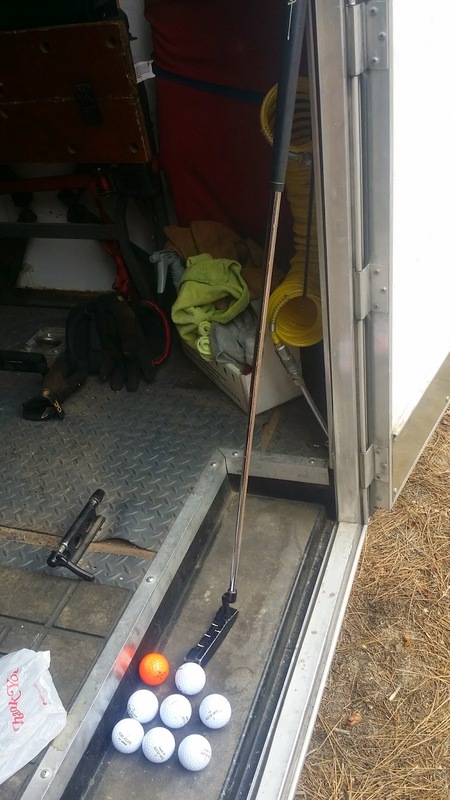 Just as we have experienced at other RV parks around the United States, when the end of the Memorial Day holiday weekend arrived Monday you can almost hear a giant woooshing sound as the weekenders are sucked out of the park by the giant, unseen "back to work" vacuum. The XLTE *** is back its normal fast self, the campground WiFi is blazing fast again, the shelves of local stores have been re-stocked, and the local traffic is back to normal. The first order of business Monday morning was to walk over to Raley's and buy a pound of "nitrate free" bacon to cook outside on our recently acquired, thrift shop special, Coleman propane stove. It has been sooo cold in the morning until this weekend that cooking outside was not very appealing. It's only about 1/2 mile to the store and we were back from our shopping foray within 45 minutes, firing up the Coleman, and cooking the bacon. We prefer not to cook bacon inside the coach as it creates, over time, a greasy mess, so having the option of cooking outside is very appealing. Once I was done with the bacon TLE ** cooked up some great scrambled eggs to go with the bacon and bagels.....now this is more like camping, right? The second order of business was to get out the tandem, which we had not ridden since the end of January......just before my unexpected hernia surgery. Our plan was to ride southwest on US 50 up to Meyers and back. About 2.3 miles from the campground at the intersection with Elks Club Drive a bike path begins which runs the remaining 2.5 miles over to the far side of Meyers. On our return trip we passed by "C" street (the entrance to TVC ****) and headed north past the "Y" about a mile up towards "The Burger Lounge" where TLE announced that her "bum" was done sitting on a bike seat for the day, so we stopped in and ordered some fried zuccini with a couple of soft drinks. We were home by 2 having ridden about 13 miles on the tandem. We are both looking forward to more tandem riding over the next few months. After we had changed I went back out to clean my mountain bike (Intense 5.5) in preparation for another outing on Tuesday. I found, however, that the rear tire on the tandem was flat......uggghhh.....why is it always the rear tire? Apparently we ran over a staple on our ride......taking the rear wheel off the tandem is more involved than on regular single bikes because in addition to the regular rim brakes, the tandem also has a "drag brake" for extra braking power. The "drag brake" must be unbolted from the frame before the wheel can be removed making this 10 minute job take more like 45 minutes. I easily found the holes, patched them, and began the re-assembly. By that time Debby came walking by to ask if we wanted to go for a walk along the Upper Truckee River around 7:30, and we answered in the affirmative. TLE was preparing chicken for dinner when I got a text from Debby saying some of the workampers were going over to the "Flight Deck Restaurant" (4 stars on Yelp) at the SLT airport at 5:30, and did we want to join them.....hmmm, that chicken was almost done.....well, we agreed to meet them around 6 after we ate, and just have drinks. It was an opportunity to meet and get to know some of the other workers. We had a great time getting to know Bob, Marilyn, Bubbles, Ranger, Billy and Wes better....what a great group! Apparently they get together every Monday night for dinner, so we'll have to add that to our weekly routine. On the way home we put in 7 gallons of gas at $4.14 a gallon.....ouch! Thank goodness we are not doing a lot of driving....the last time we filled up was in Sioux Falls, SD a few weeks ago! We watched the NHL L.A. Kings defeat the Chicago Blackhawks to take a commanding 3 games to 1 lead in the playoff series before watching the season opening show for Master Chef, and then the next episode of "24". After the workout I had Saturday, and frankly all the activity of the prior week I was ready for a down day......just relax and watch sports, and Sunday had it all......a very exciting Indy 500 which featured a photo finish, a PGA tournament that added a 3 hole playoff, the Rangers vs. Montreal NHL game, and finally the Spurs vs. Thunder NBA game. Although I did not see the baseball game (it was blacked out), I understand Josh Beckett of the L.A. Dodgers pitched a "no hitter" against the Philadelphia Phillies.....what a Sunday! I spent the better part of the day sitting outside watching the multitudinous sports offerings, and, for the most part stayed out of the crushing traffic jam around the lake. I say "for the most part" because I did venture out one time for about 15 minutes to run over to the local Verizon Wireless store.......around 10 am the various applications on my phone quit working.....they would just not load. I thought something was wrong with the phone so around 11:30 I drove the 2 miles over to the store. It turns out that in spite of the recently upgraded broadband capabilities made by Verizon here in the SLT* vicinity (they now have XLTE) the population explosion of weekend visitors for the Memorial Day weekend to the area completely overwhelmed the Verizon towers resulting in my problem. The mind numbing traffic I encountered was mute testimony to that fact.......staying here in the relatively secluded, off the beaten path TVC** (Tahoe Valley Campground) provides a shelter of sorts from the influx of the summer holiday season out-of-towners and the resulting congestion, but does not protect you from its impact on wireless broadband. Fortunately, I was able to connect my phone to the campground WiFi and stay in touch with the outside world for the duration of the day. Although TVC** remains relatively quiet, even on this Memorial Day weekend, it has filled up considerably compared to a week ago when this view included no RV's whatsoever. I grilled some Salmon for dinner, and TLE*** provided the sides....roasted, glazed carrots, and a great salad which we ate outside for the first time since we arrived 9 days ago....in fact we sat outside until well after 7:30 pm, and took a walk around the park as the sun began to set. At Bill and Debby's Happy Hour party Friday night I met several locals who know the local mountain bike trails pretty well. I agreed to meet Mark and Michelle at what they referred to as the "2nd gate" on Oneidas around 9:45 Saturday morning. The "2nd gate" is less than 5 miles from TVC, so is very handy for me. Mark and Michelle live near Zephyr Cove on the Nevada side of the lake, so they had a little bit of a drive, but they arrived just a few minutes after me. There were a few other people who were joining our group ride, but they had not yet arrived at 10, so it was decided that Mark and I, decidedly the slower "climbers" in this pretty young group, would begin the 3+ mile climb to the top of Oneidas expecting Michelle and the others to eventually overtake us. The climb on Oneidas to the top is a paved, single lane road and gains around 2,000' in elevation over the course of the 3+ miles. Included in that elevation gain are grades that consistently range from 10-15%. As we climbed we were passed several times by trucks hauling bikes to the top. The problem with doing this is you have to either ride back to the top after the downhill to get your vehicle, or have a second vehicle at the bottom for the shuttle back to the top. Part of the point of riding for me is the cardio/pulmonary benefit of climbing, and Mark and Michelle feel the same way. Mark and I took a break at the "Corral Gate" as it is called, waiting for Michelle and the others to catch up....about 5 minutes after we arrived Michelle joined us sans the others.....they had not yet arrived at 10:15 so Michelle started the climb with out them. Ultimately our plan worked, and our group managed to meet up at the bridge on the Armstrong Connector trail where we were joined by Steve, Julie, Heath and Tara for the next portion of our ride. Originally we were going to continue climbing via the Armstrong Connector, but Mark, Michelle and I decided to head downhill on the "Connector" back to our cars. This is my first significant mountain bike ride since New Year's Day, so I figured to keep my total distance at around 10 miles....the downhill portion of the ride is much longer than the climb as it winds its way back down to the "2nd gate". As we slowly descended through the forest on this nicely graded single track trail, with just enough technical sections to make it interesting, I found myself lost in the moment just enjoying the flow of the trail and the relative quiet as we glided downhill carving the turns, and overcoming the occasional rocky sections. About half way down we took a break and were surprised to see the other four riders, who we thought were going to continue climbing, catching up to us. We continued on down the trail as a group of 7 spread out over several hundred yards snaking our way to lower elevations. We reached the cars about 12:30.....it was a perfect first ride for me with the promise of more to come over the 3 months we are here, and that is what spending the summer at Lake Tahoe means......a lot of time to integrate into the local area, and specifically spend a lot of time exploring the local mountain biking trails. Although I am 15-20 years older than everyone in the group I fit in well with their riding style, and look forward to more rides as the summer progresses. On my way to the meetup point for our ride I drove past the "South Lake Tahoe Flea Market" at the intersection of HWY 50 and Elk Club Drive and thought to return later in the afternoon with TLE to do some browsing. This is a weekly flea market that is held every Saturday and Sunday May through September. As I surmised TLE was definitely into returning later in the afternoon to check out the flea market, so we headed back over around 2:15 and spent about an hour browsing.....TLE found a few books, and I found a couple of small tools I needed for my collection. We will definitely return here often this summer to find new treasures, which we may not be able to live without. There is an admission fee of $1 per adult, which is certainly a good value. By the time we arrived back to the car I was starting to feel the fatigue of the earlier MTB ride, so after a couple of additional stops we headed home and I quickly found my way to my recliner where I took a delicious nap. Saturday was the warmest day we have had since we arrived topping out at 74 degrees, and Saturday night was the first night I have slept with my bedroom window open allowing that wonderful Tahoe aroma find its way into our sleeping quarters. What we love about settling into an area for a period of time is getting to know the local people, hangouts, points of interest, etc. When we first moved into our Newell on a full time basis in February of 2011 we began our new life in a county park called Rancho Jurupa Regional Park in Riverside, CA. Now, Riverside was just 13 miles from our stix and brix home of 25 years, but we had never really spent any time there, and knew virtually nothing about the city. Over the next year we became very familiar with Riverside, and really came to love its energy and charm. Although we still own our home in Ontario (we lease it out 1 year at a time) we have come to consider Riverside our home town now. We experienced this same dynamic when we spent just over 5 weeks living in Cedar Key, FL beginning in late December, 2013. Next to Lake Tahoe, Cedar Key is one of our favorite places in the United States. Many of the friendships we have formed since we began traveling find their roots in Cedar Key. We first met Bill and Debby in Cedar Key in March of 2012....just 5, or 6 weeks into our nomadic adventure. There was an immediate affinity, and then we found out they were originally from Lake Tahoe before they decided to become full time nomads. Well, that just "sealed the deal" as they say. Later that year many of us who met for the first time in Cedar Key returned for extended stays. We got to know Bill and Debby better....went bicycling with them, dinned out together, took walks, etc. When we both arrived in South Lake Tahoe a week ago we had not seen each other since February of 2013......our paths had come close to intersecting on several occasions, but things did not quite work out to hook up, yet we maintained contact via Facebook, and their blog entitled "Bill and Debby's Wild Ride". So, when we both arrived at Tahoe Valley Campground (to be referred to from this point on as TVC) it was as if no time had passed....we just picked up where we left off....and that is how it has been with our other Cedar Key friends (Chris & Cherie, Sam & Tracy, Dennis & Jeanette, Krash & Karen, Brian & Maria, and Bill & Debby). Now, with the help of Bill and Debby we are getting to know South Lake Tahoe in depth. On Friday around 1 pm we bicycled over to a local eatery that serves a Fish Taco Special every Friday.....Steamers Bar and Grill, a funky, divey kind of place with a large outdoor patio. Steamers is only a short mile's bike ride, if that, from TVC. Debby's son, Jake, joined us for lunch, and I enjoyed talking to him about the local mountain biking scene. One of the benefits about sitting in one place for a long time is you can meet people who have similar interests. One of my only disappointments about our nomadic life is the difficulty I have going mountain biking. I don't go by myself as a rule as often mountain biking takes you into remote areas where, if you are injured, it may be a time before anyone finds you, or help arrives. I prefer, especially as I get older, to mountain bike in the company of others. Later in the day, just after 5, we convened at Bill and Debby's site for their annual "It's Good To Be Home" Happy Hour. Throughout the evening we were introduced to a rather eclectic group of people.....most younger than us.....many of whom also mountain bike the local trails on a regular basis, and I was invited to join a group of them Saturday morning for a ride.....just what I have been hoping for! We met people from all walks of life, including Ron who comes every year with a keg of his latest micro brew. His brew of choice this evening was a what he calls a Belgian Quad coming in at about 8.5 ABV....a truly great sipping beer that rivals some of the best we have sampled over the past few years. Of course there were Mark, Michelle, Paul, Daniel, Julie, Steve, Danielle, Bob & Jen, and their daughter Scarlett....the list goes on, and no doubt we will see them at future Happy Hours.....this laid back, almost "island" mentality is what I am coming to love about the South Lake Tahoe vibe. After hearing rain on our roof most of the night I was relieved Thursday morning to wake up to a bright sunny day! The high would only get to 63, but that is such an improvement over the past few days, and there are a string of 70+ days coming one after the other for the next week.....yay! By the time I headed out on my daily bike ride it was getting into the mid 50's, but felt so much warmer than that as I rode my bike north once again on Highway 89 towards the Emerald Bay overlook. While I didn't feel like I was riding that much faster than the day before my elapsed time from the campground to the overlook was 47 minutes and 13 seconds this time....a 2 minute improvement over the day before. 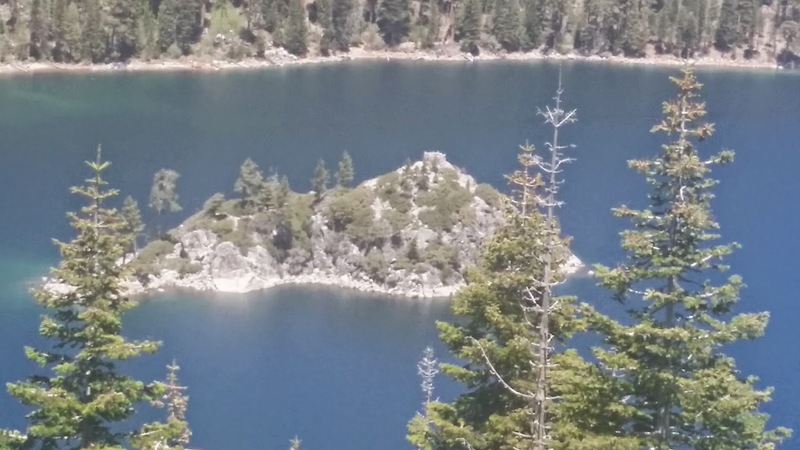 I have always been fascinated by the island in the middle of Emerald Bay......my family has always called it "Tea Island" in recognition of the "Tea House" that was constructed it by the original owner of the island, Lora Josephine Knight, who also had "Vikingsholm" constructed. The actual name is Fannette Island. You can still see the the "Tea House" on the highest point of the island. Here is an internet photo of Vikingsholm.....you can take a short hike from the main highway down to tour the house most days of the week, and we have done so on more than one occasion. 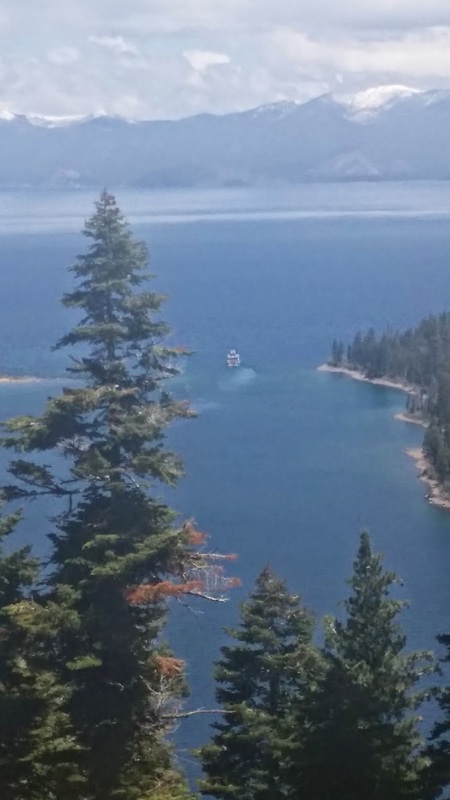 Just before I began my descent down the hill I caught this picture of one of the Paddle Wheel boats that make multiple trips per day into Emerald Bay from different points on the lake. On my way back down the hill I stopped to take a picture of the now deserted beaches stretching from Pope's beach to Regan Beach.....they will be full this Memorial Day weekend. You can see how much snow is still on the local mountains on May 22nd. Just after I returned from my bike ride TLE took a walk over to the local Raley's supermarket with her backpack to do some minor shopping.....I don't think we've driven the VW in 3, or 4 days now....we walk, or ride everywhere. Around 6:15 we joined up with Bill and Debby to walk over to "Classic Cue Bar & Grill" for some beer, food (fish tacos for TLE and I) and some "9 ball". TLE and I have not played pool for a very long time, but over the course of the evening we began to approach our youthful proficiency once again. Bill and Debby (who have their own two piece custom cue sticks) won most of the games, but TLE won 2, and I the last game of the night.....once that happened we all agreed it was time to head home. That's the fun thing about "9 ball"....anybody can win. Bill calls the proximity of most of the local hangouts "staggering distance" to home. No one was staggering this night, but we did enjoy a couple of pitchers of "Black in Black" IPA.....I am not an IPA oficionado, but I like this one a lot! Just a side note.....Bill is abstaining from alcoholic beverages for the time being as he trains for the annual Tahoe relay run around Lake Tahoe on June 14th. He will run a ten mile stretch before handing off his baton. We arrived back home safe and sound around 9:30 with smiles on our faces.....you know how you have this vision in your mind of how something you have planned for a long time will turn out? Well, I've been thinking about spending the summer here at Lake Tahoe for just about a year now, and so far our first week in South Lake Tahoe has exceeded those expectations. 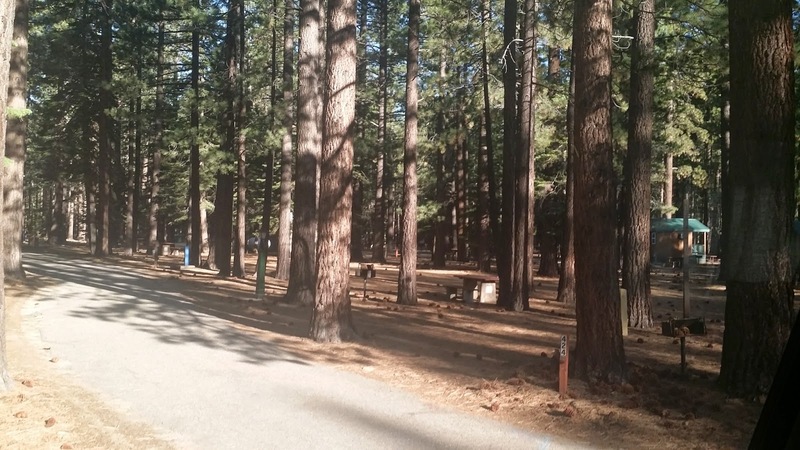 We are slowly settling into the "Tahoe Vibe".....there is a sort of laid back "island feel" to the campground and the local area around the "Y". Instead of trying to make things happen, we are just letting life come at us....a lot like we do on the road. We were looking forward to Wednesday as it was to be the beginning of a warming trend....well, that was what the weather guessers guessed. When I left on my first South Lake Tahoe training ride at 11:15 am it was still in the low 50's, but at least the sun was peeking out from behind the clouds. As I rode north on California 89 towards Emerald Bay my ears grew numb from the cold, and frankly it looked like it could start raining at any time. Around the 2 mile mark I picked up the bike path that parallels the highway, but runs through the forest for about 3.5 miles before you are forced back on to the shoulderless highway for the last 3 miles up to the Emerald Bay overlook. 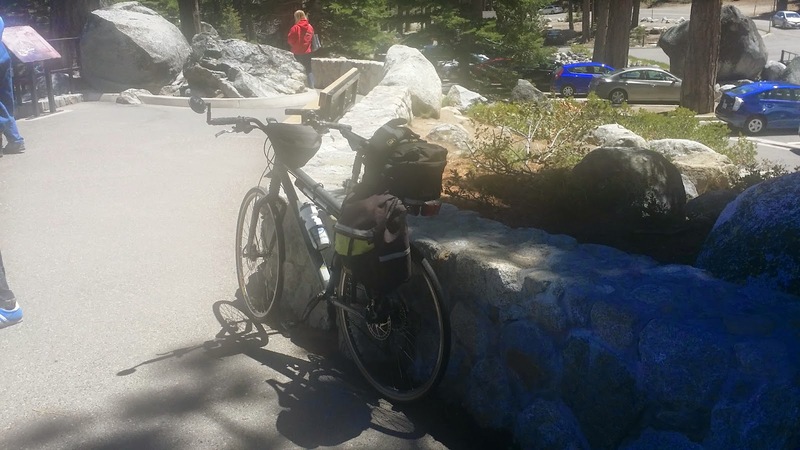 I started out at around 6,300 feet at the park, but noticed as I rode north that the road descends down to just over 6,200 feet before you begin the daunting climb up to Emerald Bay. Just after you re-enter the highway you begin a relentless climb, which turns into hairpin switch backs which are rated at 15% grades in places. For much of the last 3 miles I was fighting a 7-8% grade with short stretches between 13 and 15%. The total distance from Tahoe Valley Campground to the overlook is exactly 8.64 miles, and from the lowest elevation point to the overlook you gain just over 700' in elevation. It took me 49 minutes and 32 seconds to cover the distance. Now that I have a bench mark I will try to improve on the time over the course of the summer. Frankly, it took me less time than I was expecting....I have driven this road many, many times over the years, and it is a tough climb in a car, let alone on a bike. All of the cars which passed me gave me plenty of room. I'm not sure I would do this ride on a summer weekend when the traffic will be 10 times worse, but we'll see. The ride back down the switchbacks was a little harrowing, and I reached speeds over 35 mph a few times....thanks goodness for the hydraulic disc brakes I have on my bike! As luck would have it there is a Subway shop just a few blocks from the campground, so I stopped in on a whim on my way back to the campground, and picked up a foot long Club to split between lunch and dinner. I'm not sure if I will continue that, or just stick to the basic diet I have been on since we left Rancho Jurupa back on March 3rd, which has enabled me to maintain my weight loss. Now that I can add consistent exercise back into the equation I should be able to drop some more weight over the next 3 months. In all I burned just under 1200 calories over the 17 mile ride. I spent more time in the trailer doing more cleaning, whilst TLE did a thorough, deep cleaning of the coach.......eventually the creeping chill of the afternoon chased me back inside. The temperature continued to drop into the early evening and there were occasional rain showers starting around 5:30 and into the rest of the evening, which stopped just before I got up at 7 am this morning. We watched the season finale of "Revolution", a show which, according to reports, has been cancelled, so we don't know at this point if we will ever get to see how it turns out. We also watched the season finale of "Survivor", which, in my opinion, was one of the best seasons they have had. The winner, Tony, earned the $1 million dollar prize by "playing the game" every single minute of every single day for 39 days. Tuesday was pretty much a "wash" for us......the snow turned to rainfall around mid morning, which continued on for the rest of the day, and all through the night, and continues as I write this morning.....just a steady drizzle hour after hour. I am by no means complaining.....nothing I enjoy more than a day reading, drinking a 3rd and 4th cup of coffee while "mother nature" has her way outdoors. After I was able to rake the snow off our patio awning I only went outside one more time to rake snow off the XM radio antenna that had built up and was blocking our signal. Early in the morning we had no TV as the satellite dish was covered in snow. I think in the almost 2.5 years we have been traveling we have only lost the TV signal once due to amazingly heavy rainfall, and never the XM radio signal. Eventually the rain cleared the satellite dish and we were able to watch the Weather Channel for a while (362 on DirecTV). We both spent the day reading to the sound of electric heaters, and rain on the roof with the promise of more Wednesday, but things are looking up in the 5 day forecast. Early evening we watched the Heat emerge victorious over the Pacers in game 2 of the Eastern Conference Finals, as they always seem to do after losing game one of any playoff series. To close out the evening we watched "Lincoln", which we had not yet seen, and thoroughly enjoyed Daniel Day Lewis' performance in the lead role of Abraham Lincoln, as well as the performances of the supporting cast members. The chance of rain for Wednesday is 50% overall, but for right now we are getting the 50% chance of "no rain", and there is no snow on the ground to keep us inside. Life is good, and we are enjoying the relative quiet of the campground for the time being, knowing that this weekend is Memorial Day weekend, and the kickoff for the summer season here in Tahoe. Soon campers will be flooding into campgrounds all around Lake Tahoe and it will get a little noisier, and more congested as things warm up. I know I'm supposed to be writing about Monday, but I just thought you might enjoy this morning's view our window....this is what I saw when I pulled back the curtains this morning. And this is why I love my life........I would never be raking snow off my patio awning on May 20th in Ontario, California.....NEVER. What is exhilarating about this sudden snow fall is that all evidence of it will be gone within hours.....the sun has come out, and the snow is melting quickly......the snow has now turned to rain. Monday we ran a few errands in the morning which included the purchase of a plastic leaf rake to use to rake up pine needles around our patio area so we won't track so many inside.......never imagined I would be using it less than 24 hours later to rake snow off of our patio awning. I spent the rest of the afternoon doing to more cleaning in the trailer.....there are a number of items in the wall cabinets that have not seen the light of day for a year, or more. I found a number things that we no longer need, and probably reduced the volume of stuff by 30%. I also spent some time working on the Coleman propane stove I bought in Sioux Falls....one of the burners was not working properly, but after taking it apart and cleaning it thoroughly it now works quite well....still a great deal for $4! I also set up my trusty Black & Decker Workmate bench that I have had since the early 1980's, and got out the rest of my tools so I am now officially ready to take on all comers! Additionally, I got out the wheel covers for the coach and installed them, as well as the mirror and wiper blade covers. .......the load is about 80% walnut, and the rest pine, so we are set for the summer! There were more street tacos for dinner, and we closed out the evening watching the season finale for "Bones", and the next episode for "24". A final bit of good news on the "weight maintenance" front.....I am holding steady at 191 pounds.....still down 20 pounds from last November! Now to begin working on the next 10 pounds! We are in a short term cooling trend, which may, or may not involve rain in the next few days, but will definitely see temps in the 50's and 40's, and over night lows in the low 30's. I'm not complaining.....at least there is no persistent wind. Once we started our nomadic journey a little over 2 years ago I was determined never to spend a summer anywhere it would get over 100 degrees....even for one day. I have had a lifetime of those kind of summers, and really prefer it to be in the 70's....I'll even take 80's on occasion. 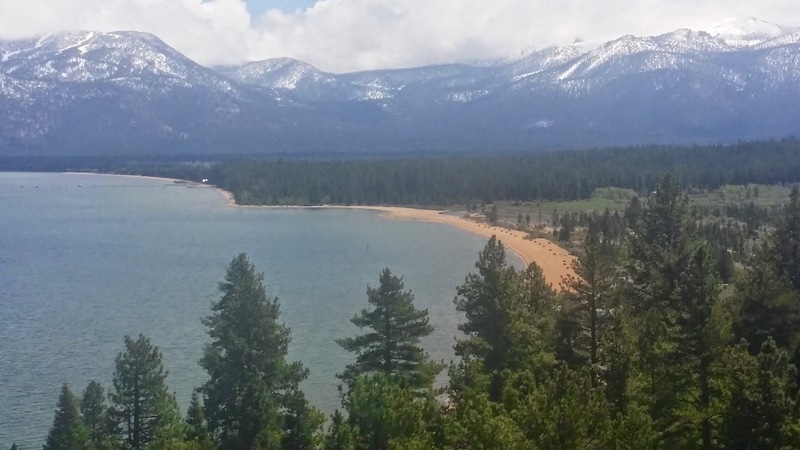 The average summer temps here in the Tahoe Basin rarely get into the 80's, and that is usually late summer. It's mostly in the 60's and 70's. We decided a leisurely bike ride would be in order for Sunday, so once I had our Cannondale singles tuned and lubed we headed out east on HWY 50 towards Stateline to familiarize ourselves with the local area as far as eateries, services, thrift shops, etc. We encountered a little wind as we rode east, but it was blowing from the west, so it was pushing us along at a pretty brisk pace. We stopped off at Regan Beach, which is just about mid town. Back in the late 80's we spent about 8 days sitting on this beach when our kids were still wee ones. It is very shallow here, and you can walk out a 100 yards, or more and only have the water come up to mid calf on your legs. A great place for young kids, and, of course, the views are long. We are basically looking due north towards Tahoe City at this spot. We found a few thrift shops open, and made note of those that were closed to visit on another day. We visited one thrift shop that specialized in used sporting goods where I found a very nice putter (golf club) for $5....a much nicer one than I got at the Goodwill, plus they sold used golf balls for .50 cents each, so I picked up 8 Top Flite's.....not sure how long that batch will last, but now I have an endless resupply source for replacement balls just a couple of miles from the campground. We stopped just short of Stateline and turned around heading back to the "Y" (intersection of US 50 and California 89) to then head up HWY 89 towards Camp Richardson. Of course, the wind that was pushing us was now in our faces. This area along US 50 through South Lake Tahoe forms a sort of wind tunnel and seems to magnify the velocity of whatever wind there may be, so at times we were heading into a pretty stiff headwind. After checking out a couple more thrift stores, and adding to our list of eateries we want to sample over the next few months we headed to Raley's (regional supermarket chain), which is just a block from the campground, to pick up a few items. I spent the rest of the afternoon putting up our decorative lights, and then tuning up Debby's Townie Beach Cruiser. The last time I worked on her bike back in Cedar Key it had some serious issues including a bent derailleur hanger that was affecting the shifting of gears. That was about a year and a half ago. This time all the bike really need were some minor adjustments, and a good cleaning of the drive train (front and rear sprockets, derailleur, and chain) and all was good. Nevertheless, I spent a few hours checking everything out while watching the conference final game between the Miami Heat and the Indiana Pacers (NBA), which the Pacers won handily to take a 1-0 lead in this best of 7 series which will determine which team goes to the NBA finals. Around 5:30 I got out the BBQ and grilled up some carne asada TLE had bought at the Carson City Trader Joe's the other day for that evening's installment of "Street Tacos". Even at 5:30 the temperatures had already dropped into the low 50's in advance of the approaching cold front, so I had to bundle up in order to grill the meat. We watched a recorded episode of "Survivor"....next Wednesday is the finale....and then the finale of "The Amazing Race", followed by the season finale of "The Mentalist". That was our second day in South Lake Tahoe.......in all the years past, going back to the early 50's, the longest we would stay at Lake Tahoe was 2 weeks.....always wishing at the end of our sojourn that we could just stay the entire summer. Now that dream has come to fruition, and here we are with 3 months to go. A day does make a difference!